Apples are part of the rose family, just like pears and plums. Best known varieties of apples are Granny Smith, Red Delicious, Golden Delicious, Gala and McIntosh. The apple tree originated in Central Asia. They have been grown for thousands of years in Asia and Europe, and were brought to North America by European colonists. 69 millions of tons of apples are produced each year. China is the greatest producer of apples in the world. There are more than 8,000 varieties of apples – the largest variety of fruit to exist. 2500 varieties of apples are grown in the USA. Only one of these varieties (known as crabapple) is native to America. Apple are one of the most widely grown tree fruit. Apples can be consumed raw or in the form of juices and different kind of desserts (apple pies, caramelized apples, apple cakes…). Apple trees take 4 to 5 years to produce their first fruit. Apple of average size contains only 80 calories and ¼ of recommended daily dose of fibers. Other than that, apples are rich source of vitamins and minerals. Apple trees are deciduous and have a period of dormancy followed by a flurry of activity in spring. Apple seeds contain low doses of toxin called cyanide. Luckily, accidental ingestion of few seeds does not induce negative effects. One cup of seeds results in toxicity that may end up fatally. Apple tree starts production of the fruit 4 to 5 years after planting. Average tree produces 88 to 440 pounds of apples each year. Bees pollinate the flowers in late spring, moving from one tree to the next. By the time the fruit is ready to be picked, the buds for next fall’s fruit are already in place. Size, color and taste of the fruit of the apple tree depend on the variety. Miniature apples are often used in the production of juices and cider. Larger apples are used in human diet. The best known varieties of apples are red, yellow, green and brown in color. The apple tree generally standing 1.8 to 4.6 meters (6 to 15 feet) tall in cultivation and up to 12 meters (39 ft) in the wild. Life expectancy for apple tree is about 100 years. China is by far the largest apple producer. The Apple is popularly known as the supposed forbidden fruit of Eden. But this is not mentioned anywhere in the Bible! Honey bees pollinate majority of cultivated apples. Bumblebees and orchard mason bee are less numerous (compared to honey bees) but equally important pollinators of apples. Apples can help you improve your memory. Apples contain high levels of boron, which stimulates electrical activity of the brain and increases mental alertness. 4 to 6 individual flowers form inflorescence. Each flower consists of 5 petals that are pinkish-white in color. Pink color fades during the time. Apple usually blossom in spring. Most of the anti-oxidants in apples, including Quercetin, are found in the skin. A medium sized apple contains 80 calories. Apples have dark green, oval leaves that are alternately arranged on the branches. 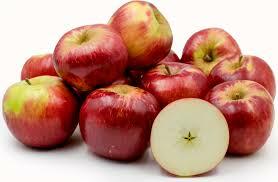 The soluble fiber contained in apples is called pectin, and can help lower cholesterol levels. To produce one apple, it takes energy from 50 leaves. Pomology is the science of apple-growing. The apple genome was decoded in 2010. The most expensive apple in the world is Sekai Ichi apple it cost $21.00 each. Sekai ichi means “world’s number one” in Japanese. Apple tree can reach the age of 100 years. The largest apple ever weighed 1.849 kg (4 lb 1 oz) and was grown and picked by Chisato Iwasaki at his apple farm in Hirosaki City, Japan October 24 2005. Cultivated types of apples usually grow 6 to 15 feet in height. Wild apples can reach the height of 30 feet. Apples were popular in ancient Greece and Rome and were a sign of opulence. In Norse mythology, the goddess of youth, Idun was believed to grow magic apples that kept the gods youthful. Apple contains 57 000 genes which is almost two times more compared to the number of genes in human. Alteration of individual genes may result in creation of better and pest-resistant varieties of apples. In the Chinese culture, the word for apples is pronounced as ‘ping’ which also stands for peace. This is why apples are a popular gift to give when visiting someone in China. There is a classic story that Sir Isaac Newton came up with his law of gravity when an apple fell on his head. Apples contain proteins that may trigger allergic reaction in sensitive persons. There are two types of allergies that exhibit different symptoms and require different treatments. The fear of apples is known as Malusdomesticaphobia.